Are you looking for the perfect focal point to your outdoor space? Or a place you can gather around with friends and family? A fire pit could be just the thing your landscape design is missing! Not only will it extend the use of your landscape far beyond the summer months of Northern Virginia, providing extra warmth and light, but it’s a great way to bring people together for those of you who enjoy entertaining in the backyard. With a fire pit by O’Grady’s Landscape, you can have all the benefits of an outdoor fireplace, without detracting from the views that surround you. So what are you waiting for? Make the most of your outdoor space this winter. Let us help you design and install the fire pit of your dreams in Great Falls, North Arlington, Vienna, McLean, or the City of Falls Church—call us at 703-533-5001 to schedule a consultation today! Whether you want to create a focal point to your backyard landscape or a gathering place by the swimming pool, our landscapers can create a custom fire pit design to help you accomplish all your goals. To do so, we’ll take into account the materials and locations you like best, as well as the scope of your landscape and any surrounding hardscapes that could impact functionality or aesthetics. Have a different idea for unique fire pit designs? Need help coming up with suggestions? Just ask one of our landscapers during your design consultation and we’ll help you determine what’s feasible for your outdoor space! 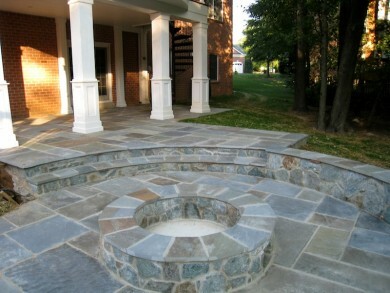 You can also view this patio fire pit in McLean for a little inspiration. At O’Grady’s Landscape, we help clients throughout Northern Virginia create custom-built fire pit designs to reflect their sense of style and maximize functionality. Our goal is to help you accomplish all your goals for the picture-perfect landscape, extending the use of your backyard space while adding nooks for socializing and outdoor parties. And, of course, we strive to create fire pits that are as stunning as they are functional. If you want to start enjoying your landscape year-round, let us help. Contact us today for fire pits in Great Falls, North Arlington, Vienna, McLean, or the City of Falls Church!